Image caption Ed Miliband said current media ownership rules were "outdated"
Labour leader Ed Miliband has called for new media ownership rules to limit Rupert Murdoch's "dangerous" and "unhealthy" concentration of power. He told the Observer Mr Murdoch's large market share led to "abuses of power". Deputy Prime Minister Nick Clegg backed new ownership rules to foster more press diversity but said an independent inquiry should be completed first. The calls follow last week's closure of the News of the World, which Mr Murdoch owned, amid claims of phone hacking. With that closure, the Sun, the Times, the Sunday Times and 39% of digital broadcaster BSkyB remain in the News Corporation stable. Under pressure from the entire British political establishment, Mr Murdoch dropped plans to buy out the rest of British Sky Broadcasting. Calling for new ownership rules, Mr Miliband said: "I think that we've got to look at the situation whereby one person can own more than 20% of the newspaper market, the Sky platform and Sky News. "I think it's unhealthy because that amount of power in one person's hands has clearly led to abuses of power within his organisation. "If you want to minimise the abuses of power then that kind of concentration of power is frankly quite dangerous." He told the Observer that current media ownership rules were outdated, describing them as "analogue rules for a digital age" that do not take into account the advent of mass digital and satellite broadcasting. 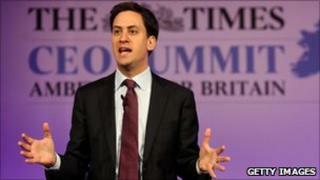 Meanwhile, the deputy prime minister echoed the calls for media ownership changes expressed by Mr Miliband. He told BBC One's Andrew Marr Show there was a need to "look again in the round at the plurality rules to make sure there is proper plurality in the British press". "A healthy press is a diverse one, where you've got lots of different organisations competing, and that's exactly what we need," he said. The Liberal Democrat leader said his party had been calling for the change for years but said he was "very happy to sit down" with Mr Miliband. "The judge-led inquiry will, of course, during the course of a year, produce some ideas about what we should do - and then I think if we can act on it on a cross-party basis. as we did last week in the House of Commons, all the better," he said. However, Defence Secretary Liam Fox told Sky News' Murnaghan programme that "politicians would be wise at the moment not to over-react", adding that it was "time for calmness and for people to look at these issues, yes seriously, but in a proper timescale and without hysteria". He said further regulation of the press should only happen if it was "absolutely necessary". "I think we have to be proportionate about how we deal with any of these issues, it can't be simply about jumping on bandwagons and getting today's headlines." An advert placed by News International in national newspapers on Sunday describes how the company is "putting right what's gone wrong"
John Whittingdale, chairman of the Commons media select committee, says former News International chief executive Rebekah Brooks will probably be spoken to separately from Rupert and James Murdoch on Tuesday when they appear before MPs, adding that the committee should not act as a "lynch mob"
Various celebrities including actress Sienna Miller and football pundit Andy Gray have accepted damages from the compensation fund, believed to be worth £20m. The Liberal Democrats have written to media regulator Ofcom calling for it to investigate whether the owners of the BSkyB licence are "fit and proper" following the allegations around News Corp.
Lib Dem deputy leader Simon Hughes, media spokesman Don Foster and party president Tim Farron have asked the watchdog to investigate in light of "the manifest public concern about News International's activities, the close integration of News International with its parent company News Corporation, (and) News Corp's effective control of BSkyB". A spokeswoman for Ofcom said: "We received this letter early on Friday evening. We will be considering our response next week." She added that the regulator was continuing to gather information and has already written "to a number of relevant authorities and can confirm that follow-up meetings will now be taking place."